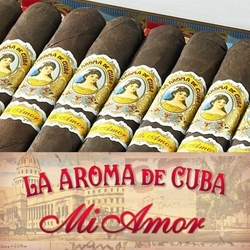 Considered a fan favorite with medium-bodied cigar smokers, La Aroma de Cuba Mi Amor are the second premium cigar line released by the Ashton Cigar Company under the guidance of world renowned cigar-maker, Jose "Pepin" Garcia. Created individually by master cigar rollers at My Father Cigars in Estelí, Nicaragua, these hand-rolled premium cigars are well balanced with complex blends of aged Nicaraguan long-fillers and binders carefully wrapped inside a Cuban seed, Mexican San Andres Broadleaf that comes from the San Andrés Valley outside of Veracruz, Mexico. Every draw of La Aroma de Cuba Mi Amor offers a rich and creamy flavor-packed smoking experience, bringing hints of earth, spice, and sweet chocolate followed by a long clean and rewarding finish. Smokers Discounts offers the perfect way to relax and unwind with La Aroma de Cuba Mi Amor premium cigars. Every cigar purchased on our online cigar store can be delivered right to your front doorstep. We’ve made it easy and affordable to buy hand-rolled cigars. A variety of sizes and flavors are listed below, each of these styles are in stock and available for a low discount price! Call us for more details!